Plasma cleaning of thin film and thick film hybrid circuits with Argon is a safe and effective way to remove epoxy bleed out, baked photoresist, solder flux, or other organic contaminants. Plasma cleaning improves wire bond strength and will increase yield and throughput. In fact, documented test have shown up to a 70% decrease in wire bond failures after plasma cleaning. A five to ten minute cycle is generally sufficient. The OptiGlow ACE or the AutoGlow can be use for this applicaiton. Most people use Argon gas with a process lasting 5-10 minutes. 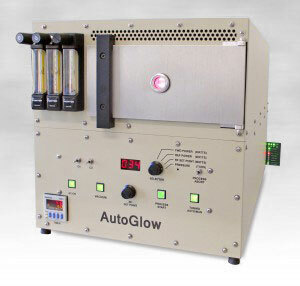 Pictured below is the AutoGlow 200 with shelves that can be powered (RIE conditions) or grounded (Plasma conditions).